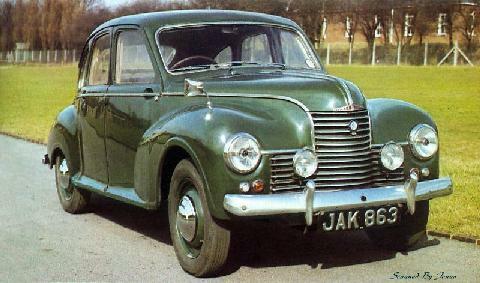 The Jowett Javelin was an award-winning British car that was produced from 1947 to 1953 by Jowett of Bradford. The model went through five variants labelled PA to PE, each having a standard and "de luxe" option. 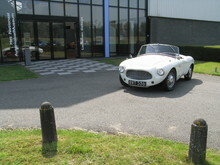 The car was designed by Gerald Palmer during World War II and was intended to be a major leap forward following the rather staid designs of pre-war Jowetts. The flat four overhead valve engine of 1486 cc with a compression ratio of 7.2:1 was water-cooled and had an aluminium block and wet cylinder liners. It developed 50 bhp (52.5 bhp on the PE) at 4100 rpm giving the car a maximum speed of 77 mph and a 0-50 mph time of 13.4 seconds. 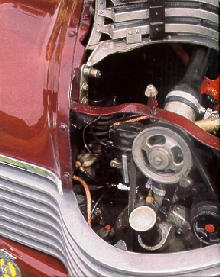 Two Zenith carburettors were fitted and PA and PB versions had hydraulic tappets. The radiator was behind the engine. 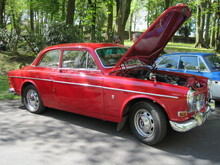 A four speed gearbox with column change was used. An early example class-won the Monte Carlo Rally of 1949 whilst another won the 2-litre touring-car class at the Spa 24-hour race that same year. 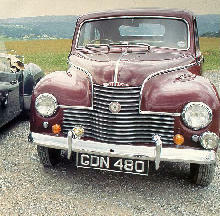 The 1952 International RAC Rally was class-won by a Javelin which also took the Best Closed Car award, while the 1953 International Tulip Rally was won outright by a privately entered Javelin. Design features included aerodynamic styling with the headlights faired into the wings and, for the time, a steeply sloped curved windscreen. 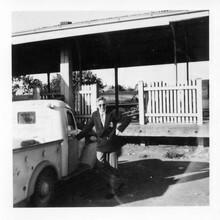 The body was of pressed steel, incorporating a box section chassis with torsion-bar suspension on all wheels (independent at the front)and internal gear and pinion steering. PA and PB models had mixed Girling hydraulic (at the front) and mechanical braking (at the rear), later versions were fully hydraulic. The car had a wheelbase of 102 inches and a track of 51 inches. Overall the car was 14 feet long, 5 feet wide and weighed about 1 ton (depending on model and year). Just over 23,000 units were produced.